In this post we're going to look at specifics of building a REST client for service to service communication within a Service Fabric cluster. We're going to discuss endpoint resolution and communication components provided by Service Fabric and how we can use them with AutoRest generated clients and ADAL. Service Fabric cluster manager takes care of spreading service instances and replicas across cluster nodes and relocating them as needed. From the internal communication standpoint the most important thing to remember is that a service endpoint is not permanent and may change at any moment. Your service may get shut down when it's unresponsive or the node it's running on is getting updated. The service may get moved to another node for more efficient utilization of the cluster resources as determined by Service Fabric. Call the naming service with a canonical Uri of the target service in order to get an actual address that can be used to make a call. Try to call the service using the returned address. Handle possible errors and decide whether we need to repeat steps 1-3 as the target service may have been moved to another node by the time we tried to reach it. Also, implementing Retry and Circuit Breaker patterns are going to help mitigate transient errors and avoid bombarding services that are experiencing issues. Service Fabric provides components that help you communicate with the naming service. 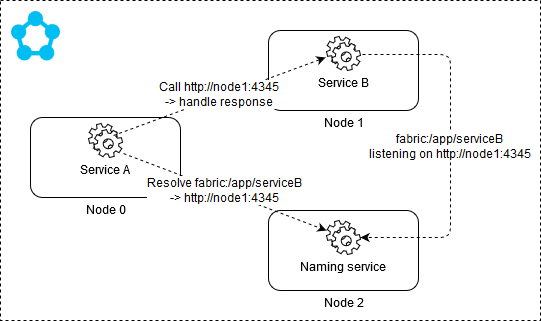 First of all, it's FabricClient which is central component for communication with Service Fabric infrastructure. It implements internal optimizations such as caching and it's highly recommended to share and re-use a FabricClient instance within your service. Another component is ServicePartitionResolver that relies on FabricClient and can be used to obtain an actual endpoint address given a canonical service Uri within a partition. Here we use a singleton instance of ServicePartitionResolver that takes care of instantiating FabricClient. We try to resolve a current address of BookFast facility service by its canonical Uri fabric:/BookFast/FacilityService using a singleton partition. Normally, you don't partition stateless services and this is exactly the case with the facility service. partition.GetEndpoint() is going to return an address of a random instance of your stateless service. Then all that's left is some parsing trivia. Unlike stateless services, stateful services often require partitioning as this is the way they scale out. So if you're communicating with a stateful service you need to provide a valid partition key (based on the agreed partitioning schema) and expect partition.GetEndpoint() to return an endpoint of the primary replica which is the replica you want to communicate to as it has read and write access to the service state. It caches resolved endpoints which improves efficiency as you don't have to call the naming service every time you want to call a service which endpoint has already been resolved. ServicePartitionClient will re-trigger endpoint resolution if the endpoint turns out to be stale. It implements the Retry pattern which is a recommended practice to mitigate self healing (aka transient) errors. There are a few more classes involved when working with ServicePartitionClient. First of all, it's communication client factory that performs most of the work by communicating with the naming service using ServicePartitionResolver and caching resolved endpoints. As the cache is maintained within an instance of the factory you want to re-use it between your calls to other services. That means, you normally want to go with a singleton instance of the factory. Now, it's called a factory because its purpose is to create instances of communication clients. Think of a communication client as a wrapper around a resolved endpoint that implements ICommunicationClient interface. In your consuming services you create factories by deriving from CommunicationClientFactoryBase and implementing its methods such as CreateClientAsync. Finally, you need a way to tell ServicePartitionClient how to handle errors and whether it should retry a call or resolve a new endpoint address. You do that by implementing IExceptionHandler. Service Fabric samples give an example of a possible implementation of the interface. In fact, you want to check out this particular WordCount sample to get an idea of how all these components fit together. I've already blogged about using AutoRest to generate clients against Swagger documentation provided by RESTful services. I recommend this approach (or any alternative such as swagger-codegen) as it removes grinding chore of writing ceremony code around HttpClient. AutoRest generates representations (models), the actual wrapper around HttpClient and the interface that this wrapper implements. Now, to be realistic, you normally build additional proxy components on top of this generated code as you have to at least handle HTTP error responses and perform additional mapping. IBookFastFacilityAPI is the generated interface and the rest is our usual proxy code. We would like to use the proxy in Service Fabric and take advantage of its communication components described above. We're not that interested in ICommunicationClient interface itself. Rather we want to get a hold of the factory method that creates an instance of the AutoRest generated client. T represents a particular client type, such as IBookFastFacilityAPI. You may wonder why we need this factory method but hold on a minute, I'll get back to it soon. The second overload accepting ServicePartitionKey is useful for stateful services. Now we have endpoint resolution, caching and retry and we still use the AutoRest generated client. Sweet! Often teams responsible for particular services provide client libraries for consumers of their services. Let's see how such a library can be implemented for the facility service. The library apparently will incorporate the AutoRest generated code together with the implementation of IPartitionClientFactory and required components. I omitted other methods' implementations as they are trivial for HTTP clients. Remember that communication clients get cached and we want to make sure to check and refresh access tokens if they happen to get stale. I rely on ADAL with its internal token cache and refresh logic to handle tokens. I've recently blogged about ADAL's cache and the possible implementation of the access token provider. We are talking about internal communication and you may have a valid question why we need tokens when communicating to internal services. Often you need to create a security context for the call and I agree that with internal services going full OAuth2 is an overkill. Even if an internal service is also exposed to the outside world we may choose to implement separate endpoints for internal and external communication. But in this case it was a migration of a stand alone service which already relied on JWT tokens to construct a security context. It's a viable approach when you're not ready to change the internals of the service. We want to go with a single instance of the communication client factory to take advantage of its cache.